Are you looking for something personal and unique for your mom this mother's day? We have just the thing. We LOVE handmade projects, AND if you can get the kiddos involved, you know it is SURE to be a winner. We were thrilled when ScotchBlue asked us to create a Mother's Day Project with them! We love ScotchBlue painter's tape because it is easy to use, makes clean lines, and can be used for so many different projects! We recently created this monogrammed tray with our ScotchBlue Painter's. It was created by A Night Owl Blog for ScotchBlue. 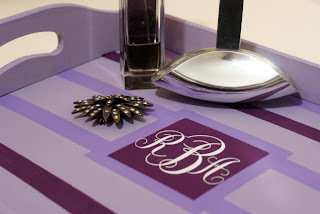 This monogrammed tray could be used to hold makeup, or even have breakfast in bed! Paint the wooden tray all over with one shade of acrylic paint. Once dry, line the tray with various sizes of ScotchBlue™ Painter’s Tape Delicate Surface with Edge-Lock to create horizontal stripes across the tray. Paint each stripe with a different shade of acrylic paint and let dry. Once dry, peel off the ScotchBlue™ Painter’s Tape. 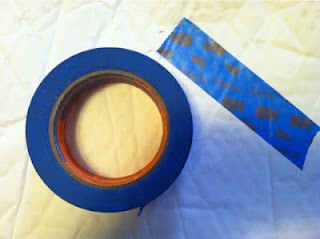 Create a square at the center of the tray with more ScotchBlue™ Painter’s Tape. Paint the square in and let dry. With a cutting machine, cut a monogram the size of the center square out of vinyl, or stencil and paint in a monogram in the center of the tray. 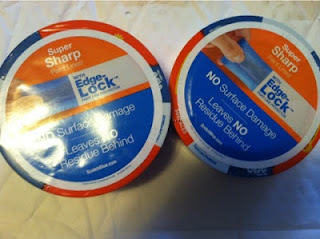 If you’re using vinyl, once cut, use transfer paper to move the monogram to the tray. You may want to cover with a glaze or sealer to keep vinyl in place. For our tray, we repurposed one we found at the thrift store! This can be a fun, easy, and inexpensive gift that looks stunning! MamaBreak receive SoctchBlue Tape to create the project and post about it here on MamaBreak. We did not receive any other type of compensation.